Constructive learning algorithms have been proved to be powerful methods for training feedforward neural networks. 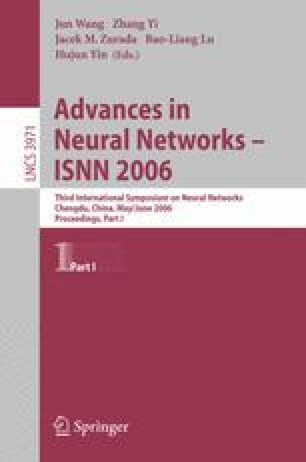 In this paper, we present an adaptive network topology with constructive learning algorithm. It consists of SOM and RBF networks as a basic network and a cluster network respectively. The SOM network performs unsupervised learning to locate SOM output cells at suitable position in the input space. And also the weight vectors belonging to its output cells are transmitted to the hidden cells in the RBF network as the centers of RBF activation functions. As a result, the one to one correspondence relationship is produced between the output cells of SOM and the hidden cells of RBF network. The RBF network performs supervised training using delta rule. The output errors of the RBF network are used to determine where to insert a new SOM cell according to a rule. This also makes it possible to let the RBF cells grow while the SOM output cells increasing, until a performance criterion is fulfilled or until a desired network size is obtained. The simulation results for the two-spirals benchmark are shown that the proposed adaptive network structure can get good performance and generalization results.